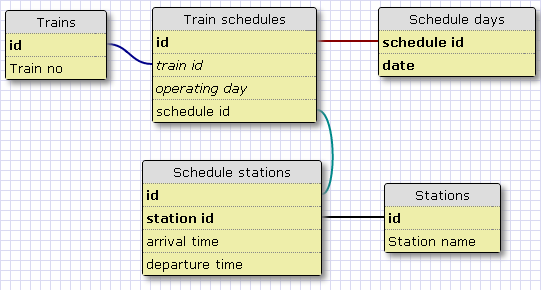 I am interested in what a MySQL database schema would look like for a train timetable. Generally this is presented in table format as the final result. So each train has a train number, but that isn't unique as the number will be duplicated for a Monday-Friday to a Saturday and Sunday. Then a train will stop at a number of station, but not all, and sometimes the station needs an arrival (a) and departure (d) time, or one or the other. Stations can be ordered by their distance. Should say train 11111 for Mon-Fri be just one entry with lots of combinations of Day Operation, ie 7 columns (M, T, W, Th, F, S, Su) ? Shouldn't it also handle a one off train that runs on say just one date and doesn't repeat weekly? By doing so, you'll make it much easier to answer questions such as "What are all the trains going to station X on 1 Oct?". It'll also makes "temporary gaps" when trains aren't running (e.g. Christmas day) possible to identify. A one-off train is now simply one with only one entry in SCHEDULE_DAYS. As the schedule can be different on weekends to weekdays, I think it's better to have separate rows for each day. This allows linking different schedules for every day of the week, should you ever need to do this. You can handle the one off runs by having date fields for first run, and termination (first date it no longer runs). This would also allow you to handle schedule changes. First run date becomes part of the primary key. You may want a surrogate primary key on this table for the relationship table. I would consider splitting the days of the week into Seven separate indicator fields. This gives you the flexibility to handle schedules that only run certain days of the week. The train-station relationship could be reduced to (train, stations, type (arrival/departure) time of day). Notes could go into a separate relationship depending on their density. Not the answer you're looking for? Browse other questions tagged mysql database-design schema or ask your own question. How to create a train schedule in SQLite3? Database schema for timesheet app?